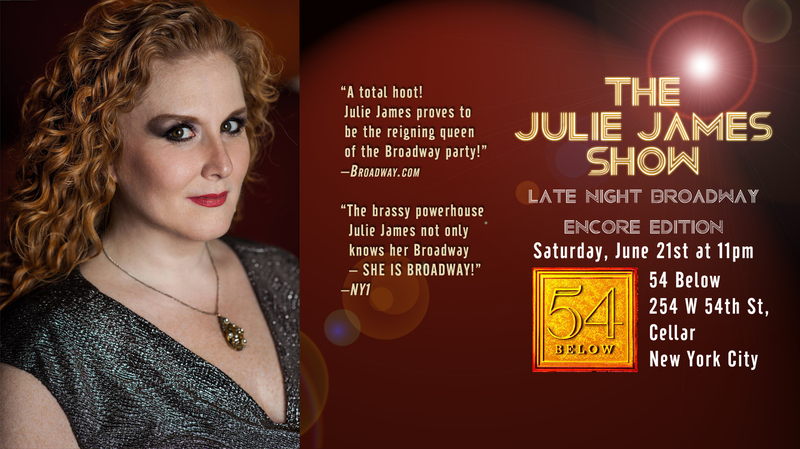 at the encore of her new musical comedy at 54 Below – The Julie James Show – June 21 at 11 PM.Julie James – an award winning vocalist, radio personality and actor – will perform short stories, original songs and long-lost Broadway standards in the one-night only performance at nightlife venue 54 Below. James will collaborate with long-time partner Aaron Hagan on the new songs and will dish about what it’s like to host the SiriusXM Radio “On Broadway” which features Broadway news and music to listener. The debut of The Julie James Show in March 2014 featured an appearance by Jon Tartaglia (Avenue Q) and his puppet Rod where they sang “The Rainbow Connection” together; Iglehart, in one of his first public appearances since winning the Tony Award for Best Featured Actor in a Musical for his performance in Broadway’s Aladdin, will join James on stage in the encore of her performance.The Julie James Show plays 54 Below (254 W. 54th Street) June 21 at 11 PM. There is a $25-$35 cover charge and $25 food and beverage minimum.Tickets and information are available at 54Below.com.